As you would know if you read this blog regularly, I’m a road bike rider so don’t know a great deal about mountain biking. However I’m always keen to learn so jumped at the chance to speak to two great women who are competing in Rockey trail and Chocolate Foot series in NSW. Meet Belinda Diprose and Monique Clark who are sponsored by Specialized and Ashfield Cycles enabling them to compete this year on Specialized mountain bikes. Three of guys who work at Ashfield Cycles – Kane, Ben & Jordan – also compete in the same mountain bike series and they asked the women to join them. Belinda and Monique both started cycling at a young age but then headed along very different ‘cycle’ paths. But they now share a love for the adrenalin rush that mountain biking gives them. Belinda started ‘real’ cycling in 1999. She was a runner who branched into triathlon and then got involved in road cycling. 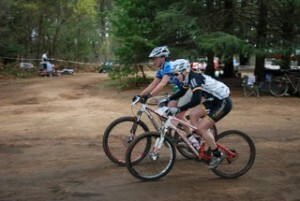 By 2007 she was racing at a high level but lost the motivation to compete so bought herself a mountain bike. Her first ride was a terrifying experience but she soon met her now partner Andrew who was a Kiwi elite level mountain biker and he taught her the ropes. When she’d only done a handful of rides she heading for Canberra where she entered the Nationals and won. Her enthusiasm grew from there. Belinda still trains on her road bike because it’s a lot more accessible but that’s where her road biking stops these days. Similarly Monique started cycling when she was five years old. Her brothers came home with a BMX they had found in the bush. They reported it to the police but no one claimed it so they painted it yellow and handed it over to their sister. Monique never looked back and has been cycling ever since. Both women competed in solo races before teaming up this year and both are enjoying the camaraderie of racing together and being part of the extended Ashfield Cycles ‘family’. Monique says she really enjoys the friendly atmosphere of the mountain bike riding events. The events include juniors, men and women and most riders are weekend warriors like themselves. Lots of families come along and make a great day of it. Since the pair have been racing together they’ve won every event so their enthusiasm continues to grow. Both in their 30s they see a great future together. I look forward to keeping an eye on their progress. If memory serves correct, Belinda was the World Masters Road Champion in 2009 (30-34) age group. Did she not tell you?